These guys are my new favorite. I know that green tomatoes are more traditionally reserved for frying in cornmeal in the summer, but fried food is not our friend. I gave it one try at the beginning of the summer in the slightest bit of oil and our tummies rebelled. Having successfully conquered okra and fennel in past years, I decided to give the old roasting a trick a try. 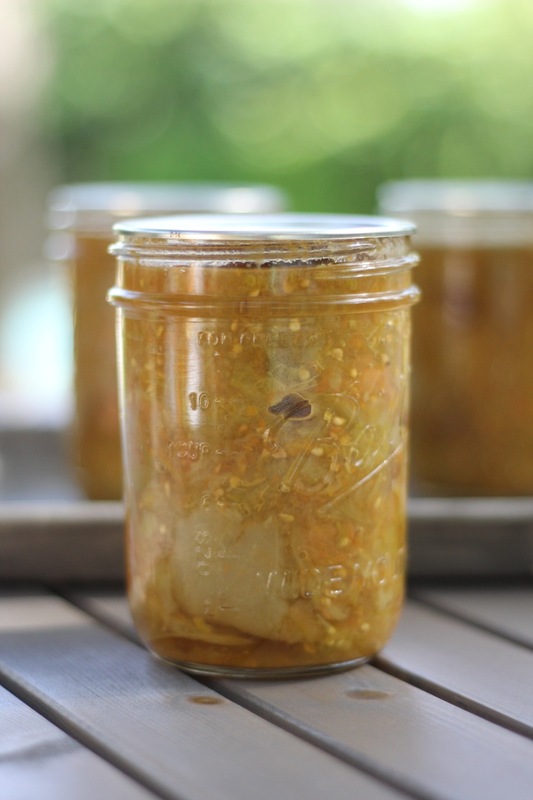 What I got was a wonderfully tangy green tomato with a slight bit of char that made the perfect addition to my first batch of summer minestrone. It was at that point that I knew that I was going to have to put some up for the year. After a little internet-sleuthing, I determined that “Green tomatoes are more acidic than ripened fruit and can be canned safely…” With that endorsement in hand and after scouring several books/recipes to put my mind at ease, I decided it was safe to proceed following the procedure for Crushed Tomatoes from the Ball Complete Book of Home Preserving (substituting the blanching and peeling step with coring and roasting). These shelf-stable roasted green tomatoes are absolutely beautiful and I suspect that the biggest challenge will be making them last an entire year!